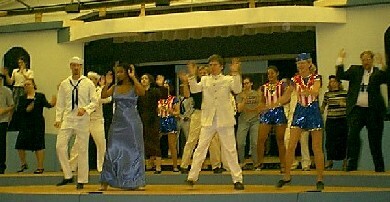 Anything Goes was my first on-stage theatrical performance. 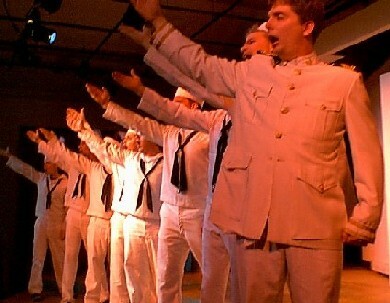 It was also the first theatrical performance for which I had a principle role. I played the part of Elisha Whitney, a stock market magnate who drank a lot and also could not see without his coke-bottle glasses. Eli Whitney is also the boss of main character Billy Crocker. This musical was also the one in which I had a personal experience with the old theater term, "break a leg." My parents drove from Maryland to see the big performance Saturday night of Parents' Weekend, along with my aunt and uncle who live in Rockville, IN. 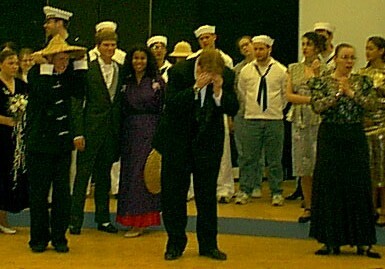 The performance went without a hitch (as I remember), until the curtain call. Eli had these great "drunk glasses" as one of the many props I used, and I went to retrieve them to wear for my curtain call. While running to the prop room, and back to the wing to make my entrance, I took a bad step, twisted my ankle, and went down. I got up, dusted myself off, took my bow, and performed the closing choreographical sequence. (Later, I would find out that the only ones who could tell I was in pain were the director, Bunny Nash, and my parents.) My parents practically ran to the stage, where the actors were greeting the audience as we always do for Rose Drama performances, and immediately asked what was wrong. I shook a few hands, took a few pictures, and then decided that my ankle/leg *really* hurt, and that a trip to the hospital would be advisable. At the hospital, I discovered that I had broken a leg bone near the ankle, slightly. I was told that I would be unable to walk for weeks, but I informed them that I needed to be able to walk in one week, and was promptly fitted with a walking cast (bright green, of course! 🙂 ) I started practicing with a cane, and was able to perform during the following weekend's shows. I had all of the cast members sign the cast, and three people wrote, "It's just an expression!" My demonstration of my fleetness(?) of foot also earned me the Purple Heart Award for the show. And although I was technically still a junior, I also earned the Senior Rookie of the Show award. Act I final scene. Photo courtesy of Brianne Johnson. Used by permission. Act II final scene. Photo courtesy of Brianne Johnson. Used by permission. Sailor’s big number, “There’s No Cure Like Travel.” Photo courtesy of Brianne Johnson. Used by permission.